Read Eric Maurer's blog here and how he was inspired. Need help on how to talk to your children about Israel? Click here for guidance. Between November 22-27, Israel was working non-stop to put out fires which damaged or destroyed more than 1,000 homes, with more than 100,000 people displaced, and more than 30,000 acres burned countrywide. Forty volunteer firefighters from the United States traveled to Israel as part of the Emergency Volunteer Project, which trains and brings emergency first-responders to Israel to assist Israel’s emergency services and the civilian population. Of those forty firefighters, two were from Baltimore-Jason Broth and Sholom Reches. Read more about their story. Now it is OUR turn to help our brothers and sisters as they prepare to rebuild. Please consider making a donation in support of those affected by the fires. A moving and inspiring presentation by Amian Frost Kelemer (COO of CJE) on behalf of all local parents who have children in the IDF. Watch here. This song was composed by a local teacher and has been taught to hundreds of school children within firing range of Gaza's rockets to help them deal with the fear and trauma of having 15 seconds to run for cover when the Color Red siren sounds. Campers at JCC's Camp Koolanu drew pictures which are being shared with the children in Ashkelon. Ashkelon residents are feeling the effect of the current situation. They are mobilizing hundreds of volunteers to pay for food for needy families and to distribute supplies for children in the shelters. Their economy is down 50 percent, which affects both large- and small-scale businesses. In order to limit their time out of the house, most Ashkelon residents only shop for essential items, thus many businesses have temporarily closed or have chosen to open for limited hours. Thousands of Israelis have been called up for reserve service, further slowing down the economy, and the decline in foreign travel decreased the tourism industry 40 percent from last summer. We're committed to supporting local business in Ashkelon. Please consider donating funds to purchase shelter supplies and meals for families from small businesses in Ashkelon, to dually support populations under fire and the local business in our sister city. Also, visit the Baltimore-Ashkelon Partnership Facebook page to see up-to-date photos of the actions taken to protect the people on the ground. 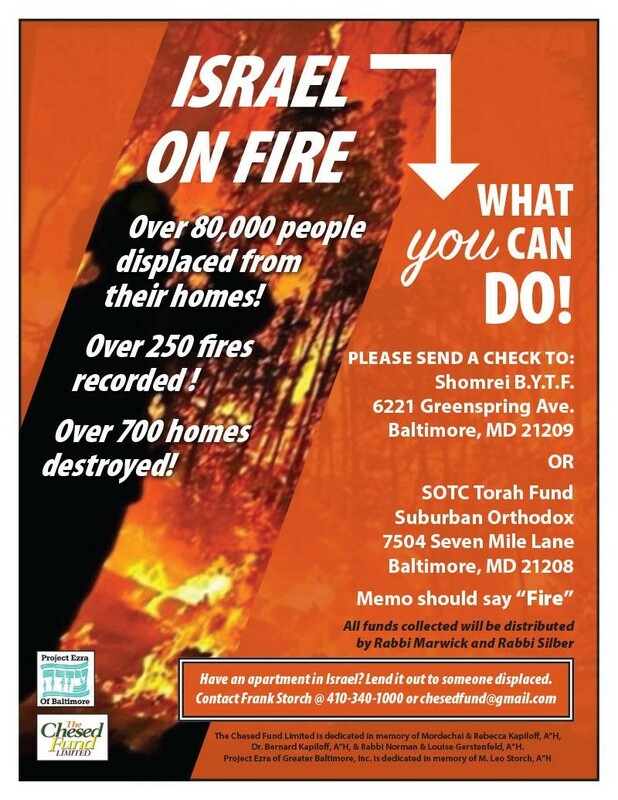 Make a contribution to The Associated’s Israel Emergency Relief Campaign. Your donation--large or small--provides care for children in shelters and critical services to those affected. Visit associated.org and follow us on Facebook and Twitter to stay updated on the current situation, share/retweet our posts and send photos showing support and solidarity using the hashtag: #BaltimoreStandsWithIsrael. Send messages to our friends and family in Ashkelon on the Baltimore-Ashkelon Partnership Facebook page. Send a personal card to the children in Ashkelon by emailing Amalia Phillips at the Macks Center for Jewish Education.